Ramadan Eve (Chand Raat): And so it begins. Scoffing as much chocolate as I can before fasting begins tomorrow! Day 1: Do not ever again feed your toddler cheesy pasta for his lunch on the first day of fasting. EVER. Day 2: Received my giveaway prize from Bismillah Babies including an Eid Decor Kit and Ramadan Journal. Now that Baby Z is a growing toddler, it is so important to get him involved and excited about Ramadan and Eid, and concepts like these are a perfect start! Day 4: It’s only the fourth day, and I think my body has become accustomed to fasting already. The hunger pangs come and go, being strongest between 10-11 am for some strange reason, but over all is not as unbearable as I had expected. This too is a mercy of Allah, and it helps that I am staying indoors as much as possible!! May Allah protect and bless ten fold those that are working outside in this Dubai heat. Day 5: Today a non-Muslim Facebook friend was inspired to fast for the day after reading my Ramadan Diaries from last year. Later in the day, she messaged me saying how she had read the Quran (in English), reflected throughout the day as well as feeling grateful for being able to cook for her son, and over all what a good experience it was. In turn, she has inspired me to be a better Muslim. Day 6: The First Blessed Friday of Ramadan has arrived! How has a week already passed? Also, today after Iftar, I may have purchased Baby Z’s Eid attire already. Am I the only one who has done Eid shopping this early? Hello… Anyone…? Day 7: Playing Football with Baby Z, even if it is in the living room and with the AC on, results in insane tummy rumblings just before Iftar! Day 8: Today we enjoyed Iftar at Barbecue Delights. On another note, the Orlando Shootings took place today and I am filled with mixed emotions of anger and sadness. Day 9: I was shocked to find, standing out in the balcony during Fajr, how breezy and pleasant it was. It was beautiful SubhanAllah. Every Muslim is facing a different kind of challenge for Ramadan in his/her country. Here in the UAE, the heat during the day is crippling, yet we are blessed to live in a Muslim country and experience the loud Adhan and spiritual Ramadan ambiance around us. On the other hand, in UK, Allah is sending down his blessings of rain and coolness to make the long hours of fasting bearable. Sunset over there is currently about 9.30 pm, which makes for incredibly long fasts. I pray Allah gives us strength to face our challenges. Day 10: I love how Baby Z almost devours everything at the table as we wait for the Adhan during Iftar. That cheeky little monkey. Day 11: Myself and Baby Z did some Finger Painting today. I am afraid he may have my OCD tendencies for cleanliness. Oops! We also had Iftar at TresInd and it was an incredible experience. Each dish was a work of Art and Baby Z loved watching the smoke rise out of the Liquid Nitrogen. Day 12: Yesterday, I posted my Hijab Story. I am touched with the overwhelmingly positive feedback. Day 13: I don’t think I have prayed as much Quran as I should have and I am struggling to balance Motherhood versus Being a Muslimah yet again. However, a few days ago I read that every act of motherhood is also a means of gaining reward and so I strive on, in hopes that my actions as a Mother will make up for the lack of recitation. After all, God is All Merciful. Day 14: Even though I make a mental list of snacks I want to eat after Iftar, whilst fasting, once I finish eating Iftar, I never have any room left! Don’t you just hate it when that happens? I’ve been meaning to eat a pack of Bugles for a week now! Day 15: Today we enjoyed a lovely Iftar with Friends and Family. Some of them we saw last Ramadan as they are mutual friends. I suppose Ramadan works as a great way to keep in touch, even if it is on a yearly basis! Day 16: Can you believe we are already in the second half of Ramadan? When did this happen? Day 17: I attended a Media Iftar at JW Mariott Marquis today and it was incredible. I didn’t know anyone there but ended up spending the entire evening chatting away to the lovely Amanda, the weekend Editor of the National, and her husband. It was such an insightful evening talking about the different ways we experience Ramadan. Also, the Iftar spread was INSANE! Day 18: I finally got around to eating that pack of Bugles. Yum. Day 19: I’ve been working on improving the blog for the entire afternoon. It’s a never ending task, and takes twice as long when you are not a tech whizz. Day 20: Today morning I woke up to the shocking news that Britain has voted to leave the EU, commonly talked about as “Brexit”. I am shocked, dissapointed and quite honestly confused as to what this will mean for the future. Several hours later, David Cameron decides to resign. It’s just one blow after another. This day will surely be going down in the history books. At least there was something to look forward to for Iftar. We went to my favourite bakery in Sharjah- Muqtar Bakery, along with a delicious glass of Fruit Cocktail Juice. Day 21: We have now set upon the last Ashra of Ramadan. The last 10 days, in which one of the odd nights holds the night of immense reward- Laylatul Qadr. Day 22: I do feel bad that I am unable to take Baby Z out for our usual morning strolls due to the insane heat, but I am trying to make it up with other activities. Currently, he is obsessed with painting and I love watching him get creative! Also, I’m trying to introduce colours to him, but so far its not going too well as apparently every single colour is “Blu” (Blue)! Day 23: Hungry. Just hungry. Day 24: Today Mr Z and Baby Z went off for an Office Iftar together at JW Marriott Marquis. Of course, I ended up whatsapp-ing them within an hour and a half of them leaving, to see if everything was “fine” and tried to act very cool as I waited for his response. Even though I know Baby Z is in the safest of hands, that compulsive motherhood trait just takes over! Turns out Baby Z enjoyed a plate full of sushi and was just fine the entire evening after all! I am so proud of the bond both my boys share, this father son duo are just the cutest. Day 25: Why is it that as soon as I start praying Fajr, I feel pangs of thirst and wish I had drank more water, even though minutes before the adhan sounded, I was too full for another sip of water?! Is it just me this happens to? Anyway, Iftar today was at a Family Friend’s. They gifted Baby Z with a bouncy giraffe he can ride, and he is obsessed with it. On a darker topic, the Istanbul Airport came under attack today. It angers me that human lives are thought so little of by horrible individuals. Day 26: Today we enjoyed a lovely Iftar at a Friend’s, and I took along a tray of Avocado Mousse. It was interesting how we get a peak into different traditions through these Iftars. Day 27: Though Laylatul Qadr resides in one of the odd nights of the last 10 days, it is speculated to most likely fall on the 27th day of Ramadan. The blessed night of Laylatul Qadr is worth worshiping for a 1000 nights. The sunset was magical today, as the whole sky turned a magnificent orange. Also, I went for my first ever Taraweeh prayer in a masjid. It was beautiful. Baby Z was with his Dad and Uncle, and pretended to pray alongside them the entire time. The loud echo of “Ameen“s flowed in each of my veins, touching my soul, and took me back to our days of Umrah. As I left, I promised myself to make it a habit to go for Taraweeh prayers in the masjid on every 27th of Ramadan, In sha Allah. Day 28: Quite a productive day today! After Iftar, the husband treated himself to an early Eid present, and I treated myself to the sweetest smelling candle, amongst other bits and pieces. We ended by booking tickets for my grandfather to join us over the summer for a month. I’m so excited for him to see Baby Z again! On a darker note, I woke up today morning to news of an attack on a cafe in Bangladesh. That makes 3 attacks in the space of a month, and that too in the holy month of Ramadan. I have no words, but my heart reaches out to the families of the victims. Day 29: Lots of contemplating going on as the end of another Ramadan gets closer. Yet again, it flew by far too quickly, though I will be the first to admit, I can’t wait to start snacking during Baby Z’s nap time again. Day 30: Our hands are adorned with Mhendi and Eid has been confirmed for Wednesday, so we have one more day of Ramadan left for 2016, and one more day to finish preparations and cleaning the entire home! However, all the excitement is overshadowed by the fact that there has been another attack, in Madinah this time, the second holiest site in Saudi Arabia. Yesterday it was Iraq, and what a victim said in a video I watched really stuck with me… He said “People came to buy clothes to celebrate Eid, now they are buying coffins”. Can you even imagine the pain? It feels like this Ramadan has been overshadowed by death, a reminder that we are but temporary, and death can come at any time. I could easily not mention all this, because I know it does not make for happy or easy reading, but I can’t let the fallen be forgotten. I have many more words and emotions but I will end by saying May Allah grant justice and give patience to the families who have lost their beloved. Ameen. Day 31: The house is spotless and all the preparations have been made. There are mixed feelings as I prepare to break the last fast: Happy that I can return to snacking again but sad to say goodbye to the blessed month. May Allah bless us by witnessing the next Ramadan. Eid Mubarak to everyone! I hope you have a lovely feast and an Eid filled with happiness and joy! How did your Ramadan go? I would love to know, so feel free to drop a line in the comment’s section below. 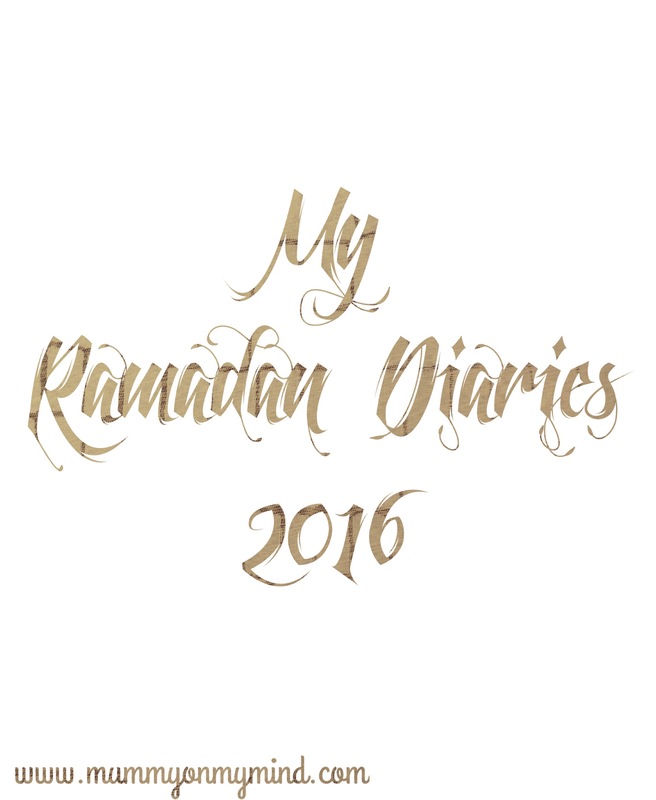 Also, if you missed it, read last year’s Ramadan Diaries here. It’s wonderful that you maintained this diary. It was a good read!